The Mariners scored 9 runs in the first game, 9 runs in the second game and 7 runs tonight in a loss to the Royals. It's not often the Mariners score seven runs and lose a game. Wait, who am I kidding, it's not often the Mariners score seven runs at all. This road trip has been an opportunity for many in the Mariners lineup to shake off some rust and get back to the basics. The Mariners continued their onslaught against the Royals, but came up short as Billy Butler hit a walk off homerun in the bottom of the ninth. Kevin Millwood started the day and did not do well at all. He gave up 7 runs in 5 innings worth of work and left his team in a 4 run hole. Kyle Seager started the days scoring adventure with a solo shot in the second inning. The Royals answered back with a 3 spot in the bottom of the inning. Casper Wells got into the homerun action in the top of the fourth with a 2 run shot that tied the score at 3. The bottom of the 4th, the Royals got two more and in the bottom of the 5th they added on another 2 to make the score 7 to 3. The top of the 6th inning, the Mariners started off with singles by Casper Wells and Jesus Montero. Two runners on, nobody out and Justin Smoak came to the plate. He struck out. Out of all the productive things you can do in that situation, a strikeout is not on that list. 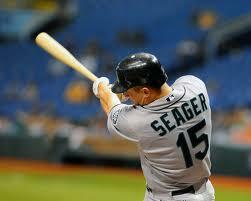 Then Kyle Seager came to the plate. Seager flew out to center and that left things to Miguel Olivo who lined a ball into right field. Casper Wells came flying around third and ignored the stop sign being put up by Jeff Datz the third base coach and avoided the tag by catcher Brayan Pena. Mariners 4, Royals 7. Top of the 7th, with one out, Ichiro Suzuki singled, Casper Wells singled and went to second on an error by center fielder Lorenzo Cain. Jesus Montero singled to score Ichiro and Wells and put the Mariners within one. With Smoak at the plate, Jesus Montero advanced to second on a passed ball and Smoak wound up striking out. Seager came to the plate and hit a shot to the fence in right field that was just over the head of Jeff Francoeur for a double as Montero scored from second and the game was tied at 7. The top of the 8th was the M's opportunity to get the lead. With one out, Brendan Ryan tripled and Dustin Ackley came to the plate. With the infield in, Ackley grounded a ball to second base and Chris Getz, Royals second baseman came home with it. As Brayan Pena made the catch and swiped at Brendan Ryan, his foot was already over the plate, but home plate umpire Jim Joyce called Ryan out. Eric Wedge came out to argue the call, but as usual, that didn't go anywhere. So the game was tied until the bottom of the ninth when Wedge decided to go with Josh Kinney against Billy Butler. I feared that decision, but, knowing that our pitching is going through the ringer with injuries at the moment, I guess he was our best option. Not a situation to be testing a guy out anyway. The rest is history as Butler stroked a homerun over the left center field wall and the Mariners had to sit back and watch the team and it's 12 fans celebrate their victory. So far this road trip the Mariners are batting .328 as a team with a .375 on base percentage. Jesus Montero leads the team with a .538 AVG in the three games, while Justin Smoak takes up the tail end with a .167 AVG on the trip. Smoak's average, despite hitting two homeruns is still going down. Brendan Ryan is at .444 so far, Wells and Ichiro are at .400. Between Justin Smoak and Dustin Ackley, the two of them went 0 for 10 total with 5 strikeouts today. Ackley is hitting .285 in KC and that will definitely raise his average. Let's hope that continues. As it is, Justin Smoak is still on a short leash. With the barrage of hitting that is going on, Smoak needs to join this party. Now if everyone is hitting and he still is below the Mendoza line, we've got issues. So far, that is exactly what we are seeing and I think, if you look closely out over the horizon, you can see Mike Carp packing his bags for Seattle. In the meantime, I am thoroughly enjoying watching this team have fun and score runs. I wish it were this way all year. Maybe we can finally bring this home and start getting things turned around there. It sure would be nice. Tomorrow is another day against another AAA call up. Felix Hernandez is going to take the hill against Will Smith. Time to get jiggy with it and put up some double digits in the run column for King Felix. I'm so ready to watch that happen. Tomorrow is our day!!! Go Mariners.